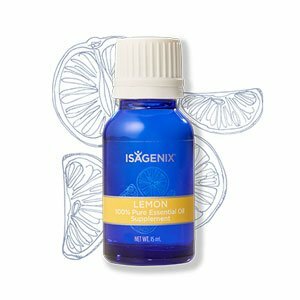 Isagenix Lemon Essential Oil - Buy Wholesale & Save! This versatile oil is often used for cleansing the body, encouraging an upbeat mood, and relieving cough and cold symptoms. It makes an excellent, powerful cleansing agent when used topically. Internally, it is known for supporting respiratory and digestive functions. Its invigorating, citrus scent is perfect for promoting a positive mood. How Can You Use This Oil? You can use this oil on your skin (topical), by consuming it (internal), or with a diffuser (aromatic). Topical – Dilute a single drop of lemon oil with 10 to 12 drops of the Essence Coconut Application Oil. Apply the diluted oil as desired. Internal – Mix a single drop of oil with 120ml of the liquid of your choice. Aromatic – Use your Essence Aromatic Cool Mist Diffuser to dispurse 8 to 10 drops of oil.